Dystopian, indulgent, surreal. All words that could be used to describe the work of Central Saint Martins graduate Hinako Nakazawa. The former fashion print student is carving out a niche for herself creating uniquely subversive jewellery, clothing, and objet d’art, gaining fans including the likes of Rina Sawayama and model Jazelle in the process. 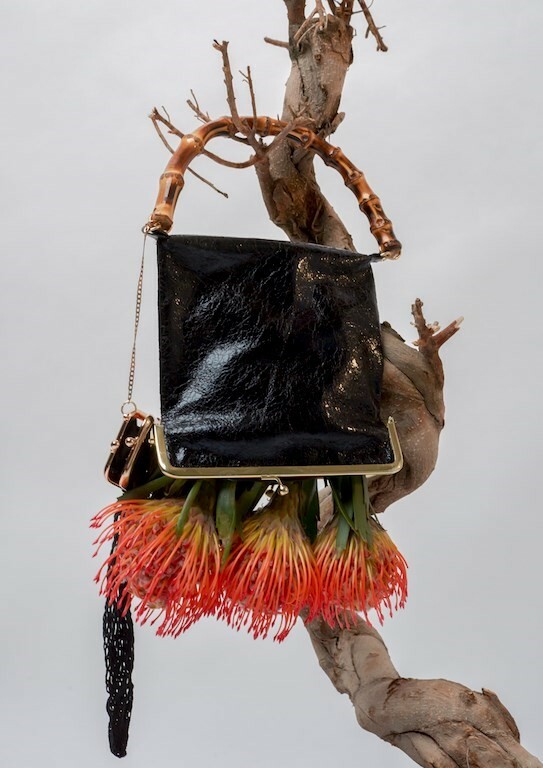 The designer’s SS19 graduate collection is inspired by the metaphysical paintings of Salvador Dali, Edgar Ende, and Rene Magritte, and drips with opulence. Painted and shaved faux fur and vintage chains and crystals sit alongside draped chiffon and glossy silk satin, as part of what is a totally sumptuous blend. Elsewhere, vintage items including silver dishes, marble ashtrays and wooden light stands provide the narrative for her dreamlike aesthetic. 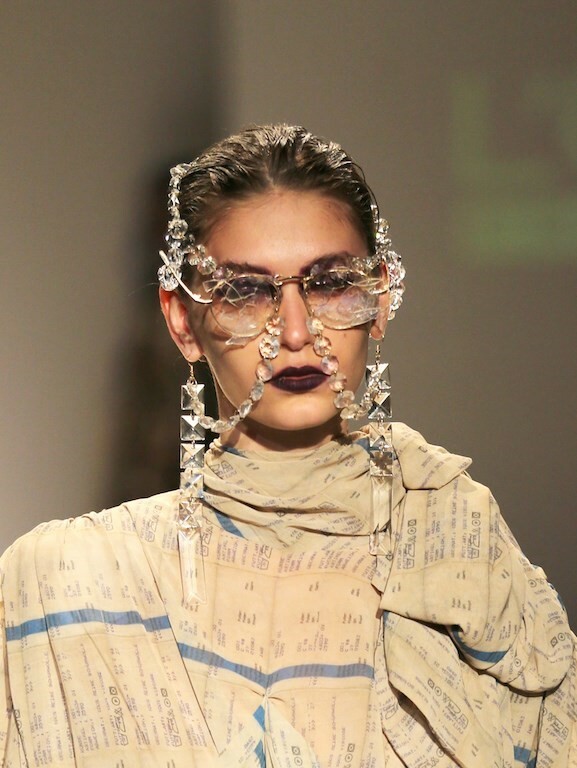 Using recycled items like broken chandeliers and spectacles, Nakazawa’s collection of eyeglasses, half gloves, and metal-framed bags – designed for the ‘sultry and self-sufficient woman’ – turn so-called trashy vintage items into something more akin to Haute Couture. “I was attracted by the emotion of tranquillity, nostalgia, bewilderment, and madness, as well as their enchanting aura,” she explains. And with Blade Runner replicant Rachael as her primary muse, the young designer’s creations – which also bring to mind the otherworldly feeling of a David Lynch or Matthew Barney film – wave a sequined hand at conventional fashion, and offer something far more avant-garde. Here, we speak to Nakazawa about her time at Central Saint Martins, her inspiration, and her final collection. I studied interior and furniture design in Japan after graduating high school, and came to Saint Martins with the intention of designing textiles and interiors, but while I was doing my foundation diploma at CSM I realised there was more freedom designing clothes than furniture. I had to think more about the engineering aspect when it came to designing furniture and interiors, whereas fashion at CSM is more close to art – I could make whatever silhouette or textile or decoration I wanted without any restrictions. I loved it! What's your earliest memory of fashion? Hinako Nakazawa: I think my grandmother inspired me a lot. I loved to look through her closet while visiting her home when I was a little kid. There were many clothes, belts, scarves, and accessories, I was like a little treasure hunter. At that time, I could not describe what fashion is, but I knew my grandmother was cool. How did your approach to design change throughout your time at Central Saint Martins? Hinako Nakazawa: I learned how diversity is important through my university life at Central Saint Martins. At CSM, everyone has a different, unique background, speaks different languages, and wears different clothes, with different cultures, religions, and genders. It was a bit of a culture shock when I put myself in this environment five years ago, but it was such an inspiration to me, it really opened my eyes. After that, I started exploring even fashion and art styles I didn’t like, which I started using as inspiration. You worked with brands including Chanel, Rick Owens, and Wales Bonner during your placement year. What did you learn from them? Hinako Nakazawa: The most inspirational brand was Wales Bonner, it was really great experience – I was doing things like moodboarding, designing shoes, hats, and clothing details, and so on. It was good to see that fashion was not only about making clothes but also fashion accessories. Also, I love the nostalgic atmosphere of her brand, the revival of a classic scene with her and her background was so new and fresh for me. It was my first time making a collection, and I was excited about going into work every day. Can you describe your creative process? What are your inspirations? Hinako Nakazawa: I have one eternal muse: Rachael, the heroine from Blade Runner. She is always my big inspiration, she just has such classic style and elegance. As far as my creative process goes, I always have a muse in mind when it comes to creating my collections, which always makes the direction of the project clear. This time around, model Graysha was my inspiration. I kept her in mind the whole time I was designing. What was your graduate collection inspired by? Hinako Nakazawa: My graduate collection was inspired by vintage items and metaphysical paintings. I love the nostalgic aura vintage items such as silver dishes and ashtrays made out of marble, because they must have had deeper and more exciting experiences than I have in their lives! The starting point of my graduate collection was the world of metaphysical paintings, created by painters such as Dali and Magritte. I was attracted by their emotion of tranquillity, nostalgia, bewilderment and madness, as well as their enchanting aura. So I wanted this collection to translate these emotions into garments. Is there anyone in particular you envision your collection being worn by? My garments are designed for six different muses from several paintings with whom I was engaged. Inspired by portraits of ladies, including those painted by Kajahl Benes and Otto Dix, my garments are designed for six different muses from several paintings with whom I was engaged. Their voluptuous faces are transmitted to my decorative eyeglasses collection. Accessories such as eyeglasses, half gloves, and metal-frame bags helped to strengthen my image of the sultry and self-sufficient women. Is there a sustainability angle to your collection? 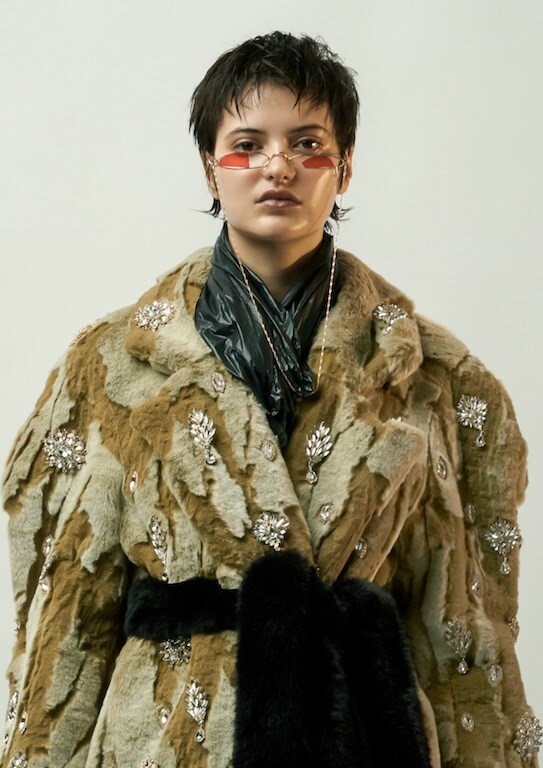 Hinako Nakazawa: My two embroidered fur coats and all the accessories are made out of vintage and second-hand crystals. I walked around many local vintage markets in Paris during the winter and collected lots of broken chandeliers, eyeglasses, shoes, and crystals, all of which were dirty and broken meaning they were really cheap! I also use a lot of vintage clothes, and vintage interior materials. I feel my collections are more worthy when I use these trashy vintage embellishments than they would be using new materials. What are your future plans, creatively? Hinako Nakazawa: Honestly, I really enjoyed making accessories like the eyeglasses and handbags this time, besides making clothes. It might be fun to focus on fashion accessory design as well as clothes in the future, I think.